I went into this novel knowing that it would have a Jojo Moyes Me Before You feel, so I was ready to fall in love and have my heartbreak. I loved it! I loved this story. Julia took me along and I totally got into the Oxford experience from classes to walking the streets to eating fish and chips to drinking beer. I fell in love with Ella and Jamie. What a couple! Loved them from that first moment they came on the page together. I loved watching their relationship develop, and even though they tried to hold back, love trumps all! For me, this was a novel about living life to its fullest, embracing the gifts you've been given, and cherishing whatever time a person has on this earth. I'm a romantic, and this hit all the cylinders for me! Highly recommend for those who love to have their heartstrings pulled! PS. Julia Whelan is one of my absolute favorite audiobook narrators. I hope she narrates her own book, because I will listen to it! Also, I am under the impression that it will be a movie. I sure hope so! 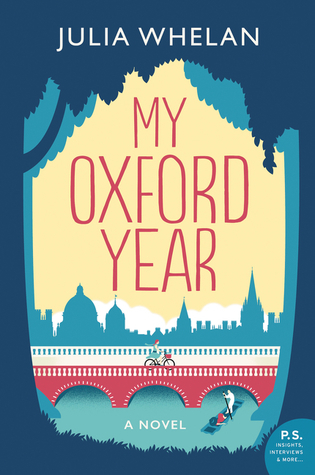 Sign into Goodreads to see if any of your friends have read My Oxford Year. I listened to Julia's narration and oh was it good!!! I will definitely I want to read The Great Alone, Thank you! bjneary wrote: "I will definitely I want to read The Great Alone, Thank you!" The audiobook is wonderfully narrated by Julia Whelan.I loved everything about this book,The quotes chosen at the beginning of each chapter are incredibly moving, particularly in relation to the chapter that follows,the story and character development, the relationships...all done with elegance! It's a book to cry over, think about and re-read. Marsha wrote: "The audiobook is wonderfully narrated by Julia Whelan.I loved everything about this book,The quotes chosen at the beginning of each chapter are incredibly moving, particularly in relation to the ch..."
I love Julia Whelan. Haven't listened to her read her own audiobook, but I have no doubt it's amazing.